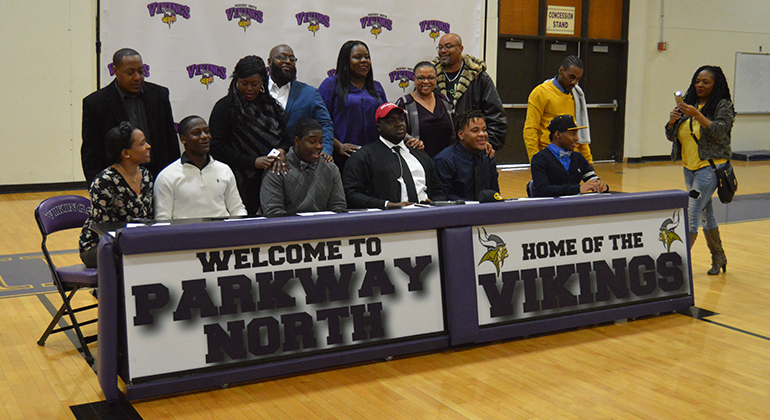 On Feb. 7, National Signing Day, six student athletes from Parkway North signed their letter of intent to the school of their choice. By signing the letter, they have agreed and committed to play their sport along with get an education at that school. “Signing on National Signing Day means a lot because I dreamed about it ever since I picked up the ball,” said senior Jason Hawkins, who will be taking his talents to Wayne State College next year. For Hawkins and many athletes, signing day is a big deal. It is a big accomplishment and a “relief” for the athletes. All of their hard work over the years has finally paid off. Along with Hawkins, four other football players at North signed. Seniors Tyson Collins, Michael Thompson, Anthony Wilson, and Elisha Williams all committed to playing a sport at a specific college. Along with the football players who signed, senior Henok Moges also signed to play soccer at Webster University. “I’m happy to be signing on National Signing Day because I get recognition for all the hard work I have put in over my playing career,” said Moges. All of these athletes get a chance to play the sport they love at the next level along with getting a good education. They are also “one step closer to the league” according to Wilson, who signed to Truman State. Ever since they were little, all of these athletes worked hard and invested time in their sport. This year’s National Signing Day was especially special for the school and community of North because Thompson, who ranks among the top players in the nation, chose the University of Oklahoma . “The deciding factor was probably how comfortable I was. You don’t want to go anywhere that you aren’t comfortable,” said Thompson. It is rare to get a player who has the talent and size of Thompson. He has been a hot topic in recruiting talk for awhile now because of his skill level and potential for years to come. He has been invited to some big events such as “The Opening” and the Army All American Bowl Game, an all star game for the top high school senior football players in the nation. “His size and skill set the standard for the defensive tackles here at North, and that will play out for him at Oklahoma as well,” said coach Bob Bunton. Friends, family, the media, and coaches came out to celebrate these student athlete’s achievement. They also came out to support their future success. “To see the gym filled like it was, is something special and a privilege for these students. It is something you want for your players as a coach,” said coach Bob Bunton. There have been, and will continue to be talented student athletes to come out of North and continue on with their education and sport at the next level.